Currently live in California after growing up in the colder climate of Green Bay, Wisconsin as a Green Bay Packer fan. The sunshine and warm weather and excellent beach location made this an easy decision to purchase and share with others as a vacation rental. Sunshine, warm weather and famous Waikiki Beach location. A lot of things to do and to see with plenty of tours, entertainment, restaurants and shopping. It makes for a perfect vacation. Can start the day with a walk on famous Waikiki Beach and see people from all over the world. The location is fantastic with the convenience of being able to walk to nearby restaurants, shopping, and hotels on the beach. The Waikiki Shore building is on the beach. Just go downstairs and outside to the beach. You can see the beach and beautiful park from the lanai. You can see the ocean and the beach while sitting on the lanai. Unlimited local calls and calls to the U. S. mainland and Canada. Air conditioning system with remote control. Enjoy dining on outside lanai or inside dining area. Oceanic Time Warner cable and high speed internet service. You can be away from it all in a private condo with large lanai, go for a walk on the beach, or join in the action of many nearby shops, restaurants and entertainment. Perfect for weddings, anniversaries, birthdays, graduations or ANY excuse to go to Hawaii. Waikiki is a "happening" place. Great location and accommodation. Full kitchen, parking, washer dryer. Will definitely come again! This was mine and my daughters first stay in a Condo. We were a little nervous, not really knowing what to expect. Terry was so helpful all the way through. We had a wonderful and relaxing stay. Just like being at home, only with palm trees and the ocean. Which does make a difference. :) Generally when we are in Hawaii, we just do things, wonder around places, always fun but this time, the Lanai was so nice, it was great to just sit out there and people watch. Fireworks Friday night were awesome. Sitting right there watching without having to scramble to get to the beach to see them. Although we didn't cook or really use the kitchen, everything you could ever need or want was there for you. And I do mean she has everything!!!! It was just a wonderful place and again, Terry was a huge help. Appreciated Jean meeting us there with the keys and such. Thank you so much for allowing us to stay there. Hope you'll allow us to come again! I am so happy to hear that!!! 9 days from now I will be on the lanai too. Can hardly wait to be surrounded by palm trees and the aloha spirit and walk on Waikiki Beach (which is the first thing that I do every day there with a cup of coffee). Like you say, it does make a difference. My cleaning lady said to thank you for helping make her job easy after you left. You are definitely welcome back any time. I feel like I have a new friend and look forward to hearing from you again. Perfect location, roomy condo, parking spot included. Wonderful location in Waikiki and very nice to have a dedicated parking spot. Right on the beach, with shopping and activities right there. Plenty of room for a family of 4. Terry was good to work with and nice to have a local contact to meet us with the keys, etc. Appreciate all of the kitchen/bath/laundry supplies available for our short stay, wish we could have stayed longer. Highly recommend this condo and owner. Thank you for your review and thank you for being such nice friendly guests to my assistants. You are always welcome for another stay. Hope you enjoyed the rest of your vacation on Maui and that you found Waikiki to be a "happening" place with something for everyone of all ages. This seems to me the best Waikiki option. It is right on the beach and the condo is a perfect size for a couple. If you need a parking spot, this is ideal. You had a really short stay so I am happy to have helped you make the most of it. The location does make a huge difference when you can relax and don't have to worry about driving and parking to get to the beach. It was fun corresponding with you I and hope to hear from you again. The condo was lovely, clean and had all the comforts of home. We really enjoyed our stay and everything was beautiful. The building had a good security system and we always felt safe. The location was perfect and we loved walking out the door right onto the beach. The private shower/foot wash just inside the gate worked well for keeping the sand from being tracked into the building. Also the owner of the condo, Terry was very friendly and efficient in all of our dealings. We do appreciate the fact that she was willing to share her wonderful home. It made our vacation very relaxed and enjoyable. My assistants and I can't thank you enough for being such responsible, thoughtful and wonderful guests. Hope that you will be back! Best location for a great vacation! We have been coming to Terry’s condo for many years now for a four week stay. She has all the amenities required and it is so convenient having the beach in front of the condo, the park next door, and the restaurants and shopping just down the street. Also the bus stop is just steps away. Thank you! You spend more time at my place than I do so I envy you. My next trip is in April for the annual HOA meeting to find out about new changes and renovations coming before your next visit. Total price includes transient taxes of 10.25% (TA license W-30162006-01) and GET taxes of 4.5% and fee of $150 for meeting you with keys and cleaning. Parking is available at no additional cost. 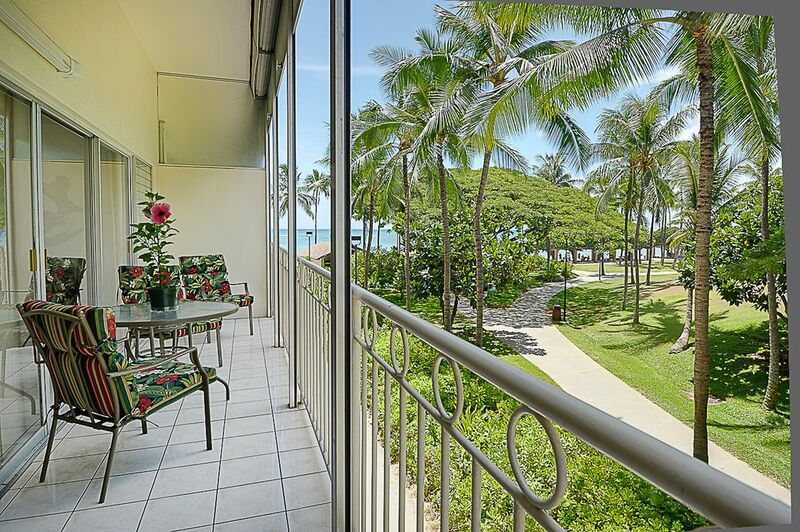 Outrigger is the island contact at 808 922-3871.